Animal assays represent an important stage between in vitro studies and human clinical applications. 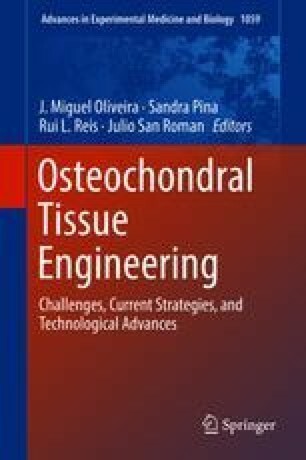 These models are crucial for biomedical research and regenerative medicine studies, as these offer precious information for systematically assessing the efficacy and risks of recently created biomaterials, medical devices, drugs, and therapeutic modalities prior to initiation of human clinical trials. Therefore, selecting a suitable experimental model for tissue engineering purposes is essential to establish valid conclusions. However, it remains important to be conscious of the advantages and limitations of the various small and large animal models frequently used for biomedical research as well as the different challenges encountered in extrapolating data obtained from animal studies and the risks of misinterpretation. This chapter discusses the various small animal model strategies used for osteochondral defect repair. Particular emphasis will be placed on analyzing the materials and strategies used in each model. Alain da Silva Morais acknowledges ERC-2012-ADG 20120216–321266 (ComplexiTE) for his postdoc scholarship. The research leading to this work has received funding from the Portuguese Foundation for Science and Technology for the funds provided under the program Investigador FCT 2012 and 2015 (IF/00423/2012 and IF/01285/2015).